A new report by the United States General Accounting Office (GAO) estimates the total cleanup cost for the radioactive contamination incurred by developing and producing nuclear weapons in the United States at a staggering $377 billion (USD), a number that jumped by more than $100 billion in just one year. The United States Department of Energy (DoE) Office of Environmental Management (EM) is responsible for cleaning up radioactive and hazardous waste left over from nuclear weapons production and energy research at DoE facilities. The $377 billion estimate largely reflects estimates of future costs to clean up legacy radioactive tank waste and contaminated facilities and soil. The U.S. GAO found that EM’s liability will likely continue to grow, in part because the costs of some future work are not yet included in the estimated liability. For example, EM’s liability does not include more than $2.3 billion in costs associated with 45 contaminated facilities that will likely be transferred to EM from other DOE programs in the future. In 1967 at the height of the U.S.–Soviet nuclear arms race, the U.S. nuclear stockpile totaled 31,255 weapons of all types. Today, that number stands at just 6,550. Although the U.S. has deactivated and destroyed 25,000 nuclear weapons, their legacy is still very much alive. EM relies primarily on individual sites to locally negotiate cleanup activities and establish priorities. GAO’s analysis of DOE documents identified instances of decisions involving billions of dollars where such an approach did not always balance overall risks and costs. 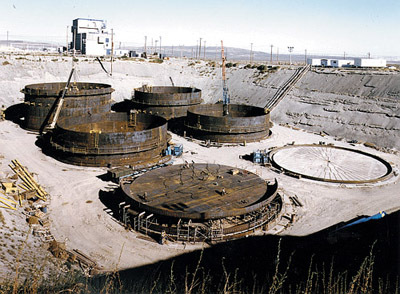 For example, two EM sites had plans to treat similar radioactive tank waste differently, and the costs at one site—Hanford—may be tens of billions more than those at the other site. This is not consistent with recommendations by GAO and others over the last two decades that EM develop national priorities to balance risks and costs across and within its sites. By far the most expensive site to clean up is the Hanford site, which manufactured nuclear material for use in nuclear weapons during the Cold War. In 2017, the DoE estimated site cleanup costs at $141 billion. EM has not developed a program-wide strategy that determines priority sites. Instead, it continues to prioritize and fund cleanup activities by individual site. Without a strategy that sets national priorities, EM lacks assurance that it is making the most cost-effective cleanup decisions across its sites. 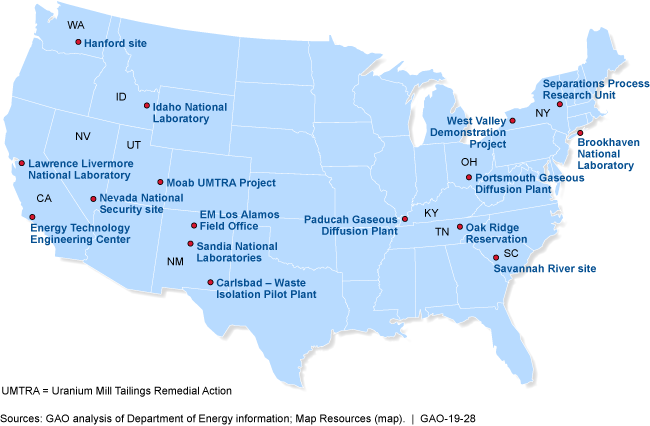 The GAO is made three recommendations to DOE: (1) develop a program-wide strategy that outlines how it will balance risks and costs across sites; (2) submit its mandated annual cleanup report that meets all requirements; and (3) disclose the funding needed to meet all scheduled milestones called for in compliance agreements, either in required annual reports or other supplemental budget materials.